E-commerce giant Alibaba Group and affiliated online payment service Alipay are aiming to use facial recognition technology to take the place of passwords. 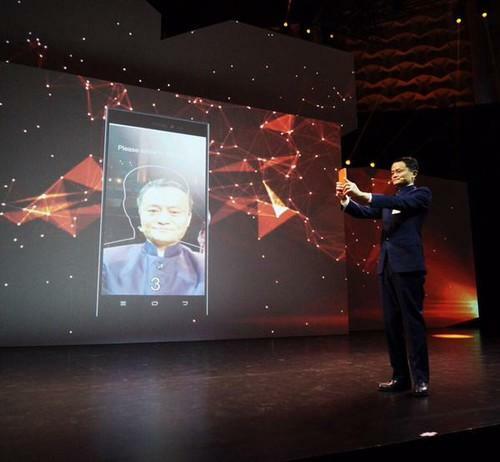 On Sunday, Alibaba chairman Jack Ma showed off the new feature while speaking at the Cebit trade fair in Hanover, Germany. Using Alipay, Ma bought a souvenir stamp from Alibaba's e-commerce site in China. But to confirm the purchase, Ma scanned his face using the front camera on his smartphone. "Online payment to buy things is always a big headache," he said. "You forget your password, you worry about your security. Today we show you a new technology." Alibaba, which reigns as China's largest e-commerce player, said Monday that the facial recognition feature was still under development. Other online payment services have also started using biometrics to confirm user purchases. Apple Pay, for instance, relies on an iPhone's fingerprint scanner. It's unclear how secure is Alibaba's technology. But the company's affiliated Alipay service is already hugely popular in China, where it has over 300 million registered users. Just over a half of the transactions Alipay processes came from mobile devices last year. And although most of Alibaba's business remains in China, the company has ambitions to expand globally. Earlier this month, the company announced it would enter the U.S. cloud computing market, by opening a new data center in Silicon Valley. Alipay, which was spun off from Alibaba in 2011, is also seeking to grow an international user base. Last October, Apple CEO Tim Cook also said he was eyeing a possible partnership with Alibaba Group to bring Apple Pay to China. The facial recognition feature, while still in a beta state, is called "Smile to Pay", according to a social media post by Ant Financial Services Group, an Alibaba affiliated company which runs Alipay. The feature was developed in partnership with a Beijing company Megvii, which provides a cloud-based facial recognition service.